Beached and wrecked 19 June 1927 after collision with the Imperial Oil tanker SS Reginolite off Talara Point, Peru. Propulsion: One 2,000ihp triple expansion engine, one shaft. 74k In port, prior to her Naval service, with the barge Whitehall in the foreground. Dictionary of American Naval Fighting Ships: Craster Hall (No. 1486) was built in 1909 by William Hamilton and Co., Port Glasgow, Scotland; transferred to the Navy 25 April 1918 from the Shipping Board; and commissioned 9 May 1918, Lieutenant Commander H. L. Mortensen, USNRF, in command. 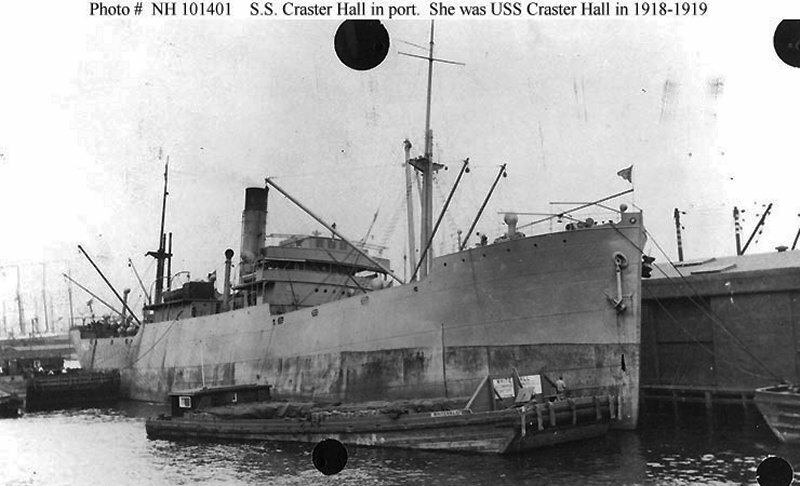 Assigned to the Naval Overseas Transportation Service, Craster Hall made three transatlantic voyages from 25 May 1918 to 7 January 1919 carrying a total of 28,112 tons of cargo. She transported steel billets, mail, flat cars, Army trucks, engines and airplanes to Bordeaux and Verdon; Army supplies to Quiberon, St. Nazaire, and Nantes, and 353 horses to Paulliac. After completing her vital supply duty, Craster Hall was decommissioned 5 February 1919 and transferred to the Shipping Board for return to her owner the same day.